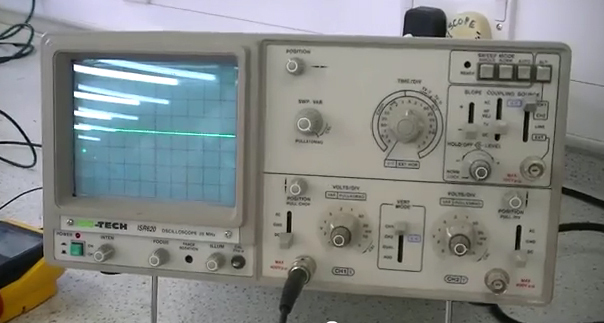 Our old friend, the oscilloscope, has made another appearance. It first made itself invaluable in my keypad safe when my chip malfunctioned. This time round it has helped me get a look into the signals travelling through my circuits. In the binary counter circuit I could see the pulses from the astable timer, how they separate into the 4 outputs of the binary counter, the wave form diagram is in my experiment post. The oscilloscope basically displays how voltages change with time, it shows as a trace across a CRT screen. This makes it really useful for checking out whats going on inside your circuit, you can see digital signals changing and check the signals timing. There is another device that can be used to look at digital signals, it’s called a logic probe. It has two LEDs that turn on and off depending on the high or low signal. One advantage of the oscilloscope over the logic probe is that you can look at any speed of pulsing signals on the scopes screen but the logic probe cant handle anything over about 5MHz. Ah, the multimeter, where would I be without you. A multimeter is an amazing tool that can measure voltages, current, resistance, test diodes and transistors and basically is an all round wonder tool. One thing I have found especially useful has been the ability to test components such as switches. During the keypad safe project I needed to add in a switch But I couldn’t work out which way round it needed to go as it was a SPDT (single pole double throw). By setting the multimeter to ohms you can see which connections work together, on an open switch you should get an infinite reading and on a closed one a reading of close to 0. So by experimenting with which connections you attach the multimeter to you can see which points are connected in which switch position . This also helped when I needed to troubleshoot my binary counter, Dean had to jog my memory as in my frustration I seemed to have forgotten all my analysing skills! There is also an audible continuity function, this is just a tone that sounds when the multimeter detects continuity in a wire or connection, very useful to detect breaks in your circuits. 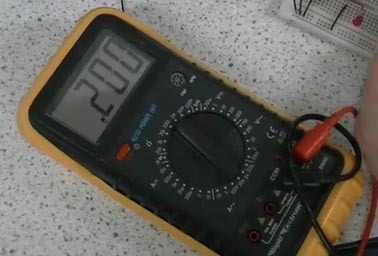 I’ve got a couple of videos of multimeters in action, one showing a capacitor charge here and one showing the changing resistance on a potentiometer here. Datasheets are also a big help when constructing and troubleshooting circuits. They have all the details for a component, have a look here 4510 datasheet and here 4028 datasheet for the data sheets I used in my counting circuits. It has the maximum and minimum working conditions, dimensions, logic diagrams and truth tables, with this information it’s easy to work out how to build a circuit and also to work out why it might not be working. The last tool in my arsenal of analysis is to always keep in mind your circuits inputs, processes and outputs. If you power up a circuit and your LED doesn’t light up/flash then the best thing to do is to start by looking at the inputs. Is your power supply working and in the right range? Are all your connections to the process portion of your circuit correct and continuous? If everything here is working then move on to the processes, is your chip in the right way round is probably the best one to start with, then check the connections, you can look at the signals going into and coming out of your chip with a oscilloscope to see if they are what you would expect (you can also match them up to the signal diagrams in the chips datasheet). Lastly if everything else is working it must be your output. This is alot more productive than randomly testing portions of your circuit and lamenting that ‘It should be working!’.